By design, minivans are not cool. On the priority list of minivan qualities — topped by “practicality” — “coolness” is at the bottom. Even as kids, we knew that minivans were things we were fine riding in (in comfort, admittedly) but not being seen in. Against all odds though, there was once a minivan most kids actually thought was cool: the Chevy Venture Warner Bros. Edition. The Warner Bros. Edition trim of the Chevrolet Venture debuted on the 2000 model year and featured a VHS player with viewing screen. Yes, a VHS player! Now you could watch Doug’s 1st Movie and Pokémon: The Movie 2000 whenever you darn well wanted to (as long as that was okay with your parents). If your family owned this special-edition Chevy Venture, you were the envy of your peers. Between 2000 and 2003, Chevy replaced the VHS player with a cutting-edge DVD player. If you didn’t own any DVDs — since your entire library was VHS tapes your parents recorded off the TV (commercials and all) — no need to fret. 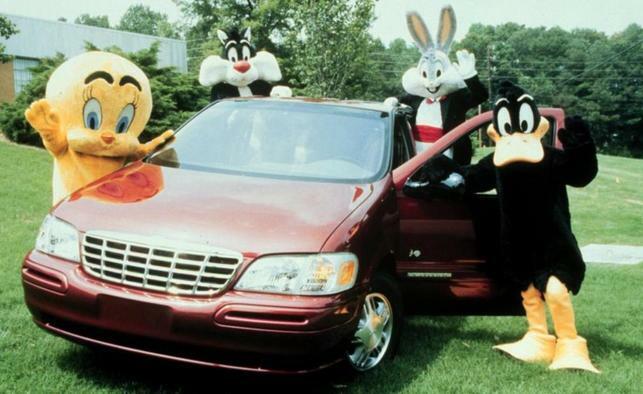 The Chevy Venture offered a DVD of Warner Bros. cartoons you could watch on repeat. That compilation disc wasn’t the only unique perk offered by the Chevy Venture. Who could forget the built-in child restraints, beach blanket, food cooler, or — the crème de la crème — a set of girl’s pajamas? You could identify the Warner Bros. Edition of the Venture by the presence of Bugs Bunny, who leaned against the Warner Bros. logo in a special vehicle badge. The minivan also touted single-color exterior paints in blue, silver, black, or red. Despite how heavily Chevy promoted this special edition, the number of Warner Bros. Edition models the automaker produced was quite low. So, seeing one on the road today is a rare occurrence akin to spotting a mythical creature. There were many flaws plaguing the Chevy Venture, and it retired shortly after the removal of the Warner Bros. Edition trim, but we owe a lot to this minivan. It was actually quite influential in the pioneering of in-vehicle entertainment. Nowadays, watching movies in your family van or SUV is commonplace (especially on your own digital devices). But back before we could easily feed our screen addiction, the Chevy Venture Warner Bros. Edition make mobile movie-viewing a reality.